“Containment” was the one of the key words that appeared on the political stage after the announcement of the Truman Doctrine, on 12 March 1947, referring to the development strategy of the United States aiming to stop the political alignment of the “free” nations with the Soviet Union and the embracement of communism. The Undersecretary of State, Dean Acheson, portrayed the so-called ‘domino effect’ like “apples in a barrel infected by the rotten one”, fearing that “the corruption of Greece would infect Iran and all the east” carrying “the infection to Africa through Asia Minor and Egypt and to Europe through France and Italy.” Following the “containment policy”, the United States launched financial aid programs that extended its political influence outside the confines of the Iron Curtain; the European Recovery Program, commonly known as Marshall Plan was initially granted to Greece and Turkey, and the Point Four Program was destined to the “unstable” region of Iran. No doubt, this was a turbulent period in the Middle East, as the escalation of the Cold War and the growing influence of the Pan Arab movement of the Egyptian President Gemal Abdel Nasser swayed the national policies of the neighbouring countries. In 1955, Britain, Iraq, Turkey, Iran and Pakistan, signed the Central Treaty Organization (CTO), broadly known as Baghdad Pact, in order to prevent the infiltration of the Soviet Union and retain the influence of the British in the Middle East. Iraq, as the par excellence Arab member of the CTO, became the main rival of Nasser’s Egypt in the Middle East and West’s rampart in the fight for the containment of Communism. Against this background, in 1950, the Prime Minister of Iraq, Nuri al-Said, created the Development Board, a governmental organization that undertook the implementation of an extensive program of modernization. The program comprised of infrastructure, housing and public facilities projects, channelling the oil revenues that flowed into the country after the agreement with the foreign petroleum companies to share the oil profits with the State. The Board’s vision initiated modernization along Western standards, effectively challenging the developmental model of Nasser and claiming the representation of the Arab world in the Middle East. Architecture and urbanism provided the means to face the nation’s housing crisis, while attempting to forge a modern identity able to incorporate the regional elements of postcolonial Iraq. Among the western architects that were summoned for the reconstruction of Baghdad and the fulfilment of King Faisal II’s vision, the Greek planner Constantinos Doxiadis is the best example to represent the “vicissitudes” of urbanism and architecture in the context of the Cold War era. 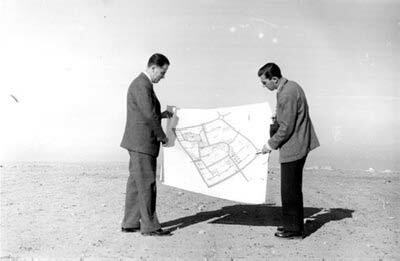 In August 1955 the Development Board commissioned Doxiadis Associates (DA) to deliver the National Housing Program of Iraq. At this time, the firm was starting its ventures in the world of planning. The Iraqi commission meant to be the first large-scale project of DA outside of Greece. It became the project that solidified Doxiadis’ reputation as a housing expert and after which many of the later firm’s projects in Middle East were modelled. Yet, Doxiadis’ abilities and skills were renowned in the international planning circles as he had led the Greek Reconstruction effort after the Second World War and participated in the missions of the International Bank for Reconstruction and Development (IBRD) in Syria and Jordan during 1954. However, it was Jacob Crane, an American expert in housing, which pulled the strings for Doxiadis, using the “American member” of the Board as a “cable”. Crane officially began his collaboration with DA in 1955, acting as a Senior Consultant in the Iraq project among others, and became a key figure in formulating the policy of DA programs in the Middle East and a nodal point in Doxiadis’ network. He introduced Doxiadis as an expert on housing and development, at a time when the Iraqis needed “foreigners on policy and program”, since they had “plenty of competent architects and engineers for design”. In this respect, the National Housing Program of Iraq was conceived as a long-term territorial plan for the shaping of the country’s physical environment according to the economic policy of the developing nation. The first phase was a five-year plan called the Basic Foundation Program: its aim was to “satisfy the most urgent needs”, “to organize the public services concerned with housing and settlements”, and “to create a suitable framework for the further development of all the complex activities constituting the national housing effort”. It comprised of three broad project categories, namely of the urban, rural and special projects, spanning from the construction of new housing units and community facilities in existing cities, to the building of new villages in former desert areas for the location of industrial workers. As such, DA surveyed the country and prepared housing, transportation and infrastructure studies for Baghdad, Basra, Kirkuk and Mosul, as well as a study for the Greater Musayyib area, at the south of Baghdad, where the Egyptian architect Hassan Fathy designed rural settlements for the recently irrigated and drained land. The housing program was complemented by the establishment of vocational schools for building trades in the main cities, in order to educate skilled workers for the (re)construction of the country. Initially for Baghdad, Doxiadis was asked to plan a new model community for 100,000 inhabitants, on the western side of Tigris. The so- called “Western Baghdad Development Program” was destined to address the housing crisis that emerged as a consequence of the Second World War in many countries. In the early 1950s, Baghdad began to experience problems of population growth when migration flows abandoned the rural areas of the country and flocked to the big cities. At that time, an increasing number of squatter settlements (sarifas) made their appearance at the periphery and within the open spaces of the old city. By reading it (this letter) you will understand that a major change has taken place in our discussions with the Iraq Government; it is the introduction of the SPA or the Special Program of Action. The introduction of this element is something which was not necessary as public opinion has been mobilized now in favour of housing and it would be impossible to tell to the public of Iraq that they have hired housing experts who will come back in 12 months time with some big volumes on housing but without having built anything yet. However, this wasn’t the first time the Iraqi state was trying to control the growth and deal with the housing problems of Baghdad. In 1954, the Iraqi Development Board commissioned the British firm of Minoprio, Spencely, and Macfarlane to prepare the master plan of Baghdad, so as to study the old parts of the city and provide a comprehensive plan for urban expansion. The plan was completed in 1956 and proposed land uses, a slum clearance program, the creation of a rural belt, and an overall transportation system, while making explicit references on sites designated for building projects by western architects. Nevertheless, the managerial skills of Doxiadis and the multidisciplinary approach of Ekistics, a planning methodology that Doxiadis coined the science of human settlements, composed an appealing formula that the Iraqi state couldn’t by-pass. In part, it was Doxiadis’ Greek nationality that gave him a “competitive advantage” over the rival planning firms; in the turmoil of Cold War the foreign assistance had to be treated with caution, especially since Iraq was under regional pressure for adopting an “Arab” stance against its western “mentors”. During the 4 years of his collaboration with the Development Board, Doxiadis not only managed to deliver every commission he was given, but was able to convince the Board for the necessity of “master programs” (instead of master plans) effectively expanding his own contact. In 1958 the Development Board assigned to DA the preparation of regulatory plans for those towns in which housing projects were under implementation. As it was characteristically said, “in the Middle East the letter “D” stands for Development and Doxiadis”. Doxiadis successfully responded to the agenda of the Iraqi government, promising to provide housing for the population in need and a framework for the development of the nation in accordance to the principles of Ekistics. DA showed an unprecedented technocratic efficiency; they established a branch office and the Housing and Settlement Research Centre in Baghdad in order to conduct experimental housing projects that would “give a purely national character to the overall housing activity”. The research concerned various aspects of the construction process (application of new methods of construction, the introduction of new materials, the training of technicians and the improvement of traditional systems) but at the same time extended to the social and economic plane. The Special Program of Action comprised of government-funded housing and “aided self-help housing” schemes, where the individuals were called to supplement a roofed nucleus or in cases build on plots “with necessary facilities such as water, electricity, sewerage and streets”. The program called for the contribution of the “beneficiaries towards the satisfaction of their own needs” and appealed to the participation of the citizens to “avoid uniformity and monotony” in the shaping of their environment. Beyond doubt, Doxiadis’ claim for a planning policy based on the “freedom of choice” of the inhabitants and the community spirit was in tune with the government’s demands and western aspirations for the territorial development of Iraq and its positioning in the Middle East. Moreover, Doxiadis’ program incorporated real estate values, assuming that “private ownership is more in keeping with the tradition of the people”. In this respect, the experimental housing program postulated the sale of the houses in order to ensure the “proper maintenance” of the settlements, even of the public space and, more significantly, produce “a revolving fund which guarantees the indefinite expansion and continuation of the housing program”. Along the same line, the private sector was expected to continue the initiatives of the State and, as such, the program promoted competitions for building contracts that resulted to the construction of numerous houses by local and international contractors in Western Baghdad. In this way, urbanism and architecture became strategic means for the social and economic reform of postcolonial Iraq, a Trojan horse that introduced a free market development model as an alternative to Communism and its radical ideal of redistribution of human and material resources. As other applications of modernization theory, the science of Ekistics was developed and promoted as an ecumenical system freed from political scopes that came to sustain “the evolving utopian realist vision within the modern movement”. In fact, Ekistics unfolded the principles of modernism and the canonical planning of CIAM to a global plane, taking its modernity to an extreme level. Beyond doubt, Ekistics was a modern “remedy” destined to contain Baghdad’s urban crisis and ensure its “proper” future development. The Master Plan of Baghdad was based on the planning principle of linear expansion, a model that later on Doxiadis would call “Dynapolis”. According to the plan, the city should develop along the central axis of the Tigris River, the most prominent natural element in the landscape that historically has been determinant for the evolution of the city. The urban elements of the future Baghdad were expected to develop bi-directionally along the axis, constituting a rectangular grid pattern. The proposed road system incorporated the existing streets and expanded by a rectilinear logic to the surrounding landscape, “engraving” the limits of the prospective residential sectors that were subdivided hierarchically to Communities of respective classes. One of the most interesting implemented proposals of DA was the opening up of a canal that connected two points of Tigris River. Realizing the importance of water for the development of Baghdad, DA’s Master Plan proposed the construction of a canal network in order to “create better climatic conditions for the more remote parts” of the city. On 14 July 1958, the Iraqi monarchy was overthrown by the Nasser-inspired Free Officers movement and the attempts for the modernization of the country were brought to an end (as the life of their inspirers, King Faisal II and Nuri as-Said). DA was one of the few firms that was permitted to stay in the country after the coup d’ état and submit its plans one year later. Since then, the Master Plan of Baghdad has been a subject of speculation in regards to the creation of large peripheral housing projects, and rather controversially connected to the “phenomenon” of Madinat al-Thawra (City of the Revolution), the notorious Sadr City. The district of Madinat al-Thawra was built in 1959 by Iraqi Prime Minister Abdul Karim Qassim and apparently formed part of Doxiadis Associates’ Master Plan and its future interventions in Eastern Baghdad. Nevertheless, there are great differences between the original Plan and the constructed reality, namely the built houses and the provisioned urban density. A draft by G. Papageorgiou, one of the closest collaborators of Doxiadis, dated October 1971, sheds some light on the case. While revisiting the projects of DA, Papageorgiou reports on the living conditions of Sector 10 in Western Baghdad and on the up-to-date progress of the Slum Clearance Program and construction works in Eastern Baghdad where DA principally designed houses for the Iraqi Officers. As in numerous cases in planning history, the firm’s Master Plan was used as a guide for development, while implemented partially or mimetically, thus provoking an a posteriori critique. However, one could parallel the “self-contained urbanism” of Doxiadis’ residential sectors and the characterization of Sadr City as “a state within a state”. The autonomy of Doxiadis’ human sectors, with their community facilities and public buildings accessed by a pedestrian network of cul-de-sacs, failed to promote the integration of the Shiite migrants and absorb ethnic, cultural and ideological differences of the inhabitants in favour of community cohesion, in the same way that modern planning and welfare state norms failed to produce a sustainable environment for developing nations. Beyond doubt, the study of Baghdad’s urban history emerges anew among the paradigms of modern planning to raise significant questions for the formation of the contemporary city. “The National Housing Program of Iraq,” Architectoniki 13 (January-February 1959): 42-46, (quotation on 45). Beyond any doubt, the input of Crane in the program was significant.